It doesn’t matter if you are a seasoned photographer or a beginner, most photographers want to learn how to make great landscape images. Once you have shot a few hundred sunset shots and a few sunrise shots, you may think you know how it’s done. Then you get out into the wild on a crisp early morning, before sunrise, and try and get some dramatic mountain scene or amazing seascape. Suddenly it’s not that easy. Landscape photography requires more than simply setting up and waiting for the shot. Sometimes you have to go back to a scene four or five times to get the shot you want. Landscape images can be seductive. 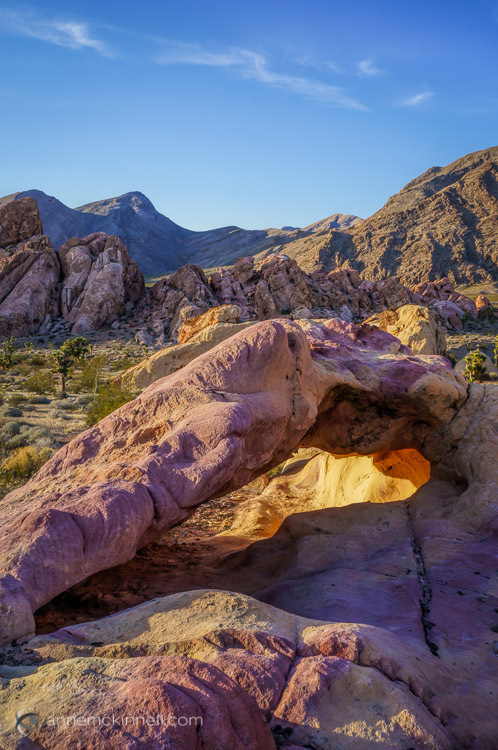 When done properly, those viewing the image are transported to that place, they can feel the crisp mountain air or the warmth of the desert. So, you might be asking “How do I get those kinds of shots?” or “I think landscape photography is too difficult, am I good enough?” This article will answer these questions and a few more hopefully. 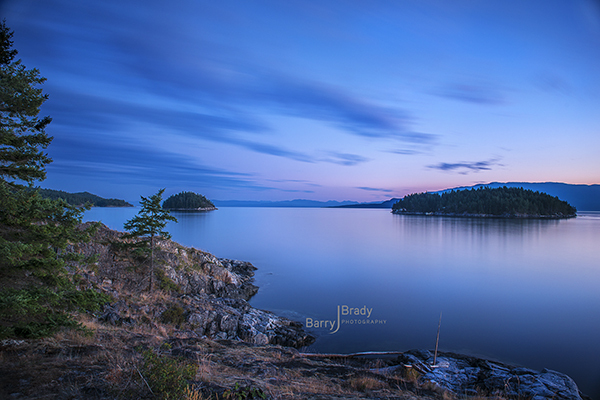 The truth is, landscape photography is not difficult, but it does require dedication and passion. It will often require being up before sunrise, staying out late into the evening, or even early hours of the morning. It also requires good knowledge of your gear. 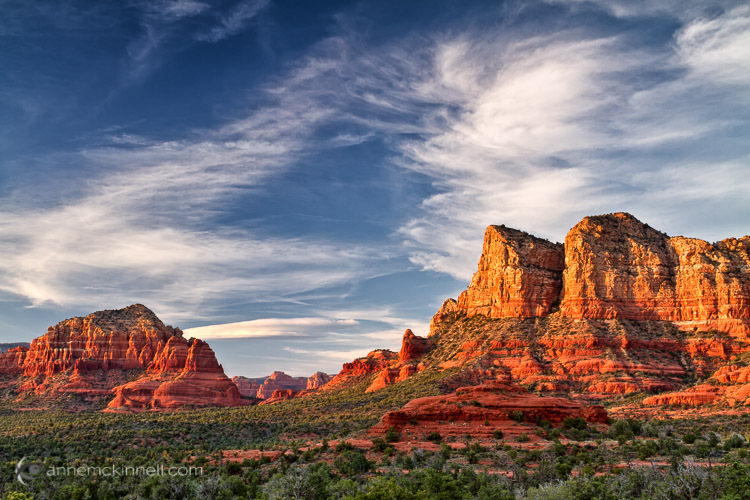 Let’s take a look at how you can start getting better landscape images. 1. How to find good landscape photography locations? Depending on where you live, you may have to drive somewhere to get some great landscape scenes. That may not be far, or you may need to get out of your city or suburb. What I often do before I visit a new place is google the area for dramatic landscapes. 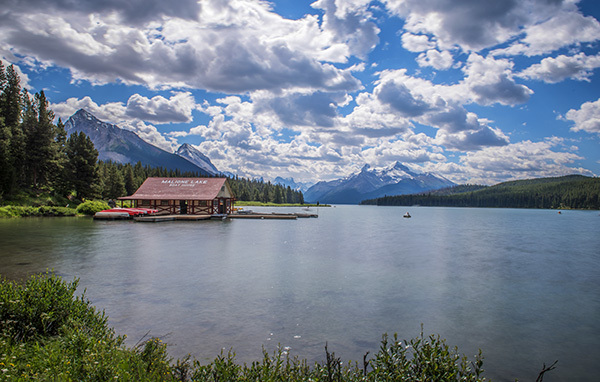 I will do a search like landscape scene canadian rockies and see what comes up. Sometimes you will see a vista that you didn’t know was in the area and you can start getting some ideas of what you will able to shoot.You can do the same on 500px or even Flickr; do a quick search for the name of the place you are visiting and see what comes up. From there you can narrow down what type of scene you want to shoot. Maybe you want to shoot from the mountain tops overlooking the city, a seascape, or even a forest scene. Once you have some idea of what you want to shoot you then need to figure out the lighting. My go to tool is The Photographer’s Ephemeris. What I love about it is that I can simply drop a pin on a map and immediately see where sunrise and sunset will be, as well as moonrise. It gives me the direction of the sun and what time sunrise and sunset will happen. You can decide what time of day will work best for the shot you are planning. 2. 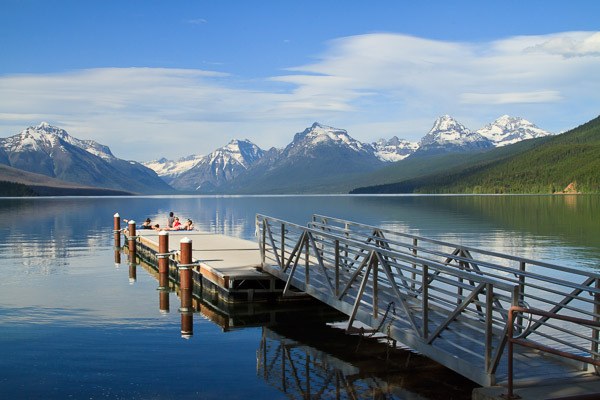 What time of day is best for landscapes? 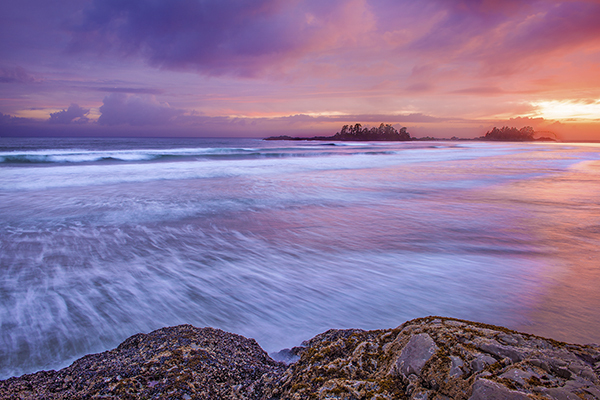 The Golden Hours are the best time for dramatic colours in landscape photography. You can also use blue hour to make some beautiful shots too; I prefer it for cityscapes, the city lights contrast beautifully off the blue sky. Golden Hour is your guide here. You will need to shoot at sunrise, sunset, or both, but plan beforehand though. There is nothing more frustrating than arriving at a scene, only to find out that as the sun is setting and your subject is in shade. If possible, visit the scene the day before at the time you anticipate shooting and watch where the light moves, that way you will know exactly where to set up your shot. 3. What camera gear do I need for landscape photography? Of course, this is a critical part of the whole formula, however, getting great landscape images does not require a 40 megapixel camera. You can shoot landscapes on any DSLR with 10 megapixels and more. The reason you don’t want to be shooting landscapes on a four megapixel camera is that you might shoot a great scene. Afterwards, you may want to print the shot nice and big and hang it on your wall, but if the resolution is too low, you may struggle to print a decent size image. Yes, you will need a tripod. If you are shooting at sunrise or sunset, the amount of light will be minimal. You need to shoot at longer shutter speeds so you need to have your camera on some sort of support. A sturdy tripod will make all the difference. The beauty about a tripod is that once you have set up your composition, you can simply keep clicking away and not worry about composing your image each time, unless you move the tripod. I took a while to buy a cable release (remote trigger) when I first started photography, but once I had it, I wondered why I took so long to get one. A cable release allows you much more freedom. You can simply hold it in your hand, stand away from the camera and release the shutter whenever you want. Also, I like to observe the whole scene, rather than just looking through the viewfinder. I connect my cable release (I use a wired one), step away, and start shooting. Be sure that once you have locked focus to switch your camera to manual focus (or use back button focus), especially if you are shooting at sunset. If you don’t, what can happen is that as night falls, the camera may struggle to lock focus and this could waste time. The best idea is to set your focus while the scene is still well lit, click it onto manual focus and then shoot away. 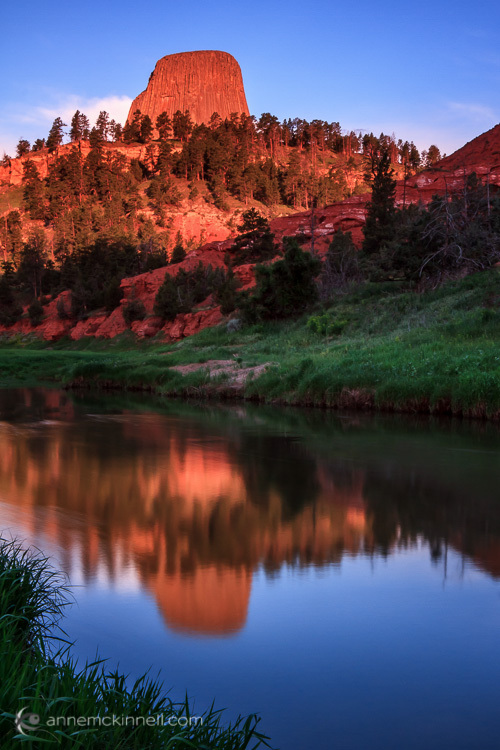 Graduated Neutral Density filters have long been the tool of choice for landscape photographers. This is still largely true, however, in recent years, many photographers have started to do more blended images. What that means is that you will expose for the bright part of the scene and take the shot, you will then expose for the dark part of the scene and take that shot. Very often, the bright part will be the sky and the dark part the foreground. Afterwards in Photoshop, you can then blend the two best exposed shots together. This is a very effective technique in tricky lighting conditions and sometimes can work better than a filter. I use a combination of both techniques. I will take some shots with a filter, then take some at different exposures and see what works best afterward. The important thing is to make sure you get the best shots while you are out in the field. There is nothing worse than coming back from an early morning or late evening shoot to see that your images did not work out well because you exposed incorrectly. Getting the exposure right in the camera is key. It takes practice, so your first attempts may not be very dramatic. Keep working on it though, you will learn how to see the light, how to use the filters, and how to expose correctly if you practice enough. For the most part, a wide angle lens will work best for landscapes. You want to capture as much of the scene as possible in your shot to make the image look majestic and sweeping, and a wide angle lens creates that effect. Be careful not to use a fisheye lens; the distortion may not work well in a landscape shot. When you use a wide angle lens, it is a good idea to have foreground interest, that means, have something in the foreground that anchors the image. If you don’t have foreground interest, thats okay, you can still get some good shots. You will find though, the images with foreground interest tend to work better. 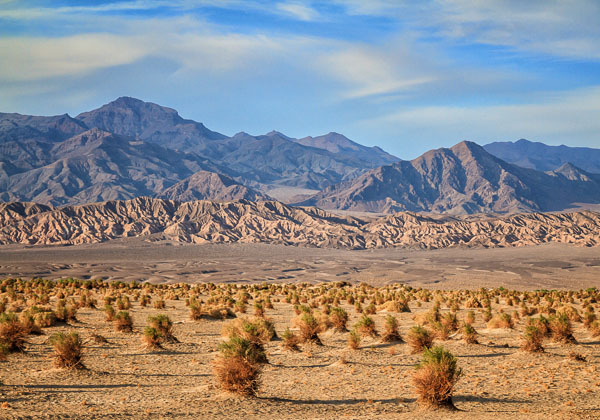 You may also want to shoot landscape images with a zoom lens. This can work well, but not on every scene. Try it out, but if it’s not working, switch back to a wider angle lens. 4. What settings should be used? There are no formulas for how to get the best landscape shot; there are a few guidelines though. First, you will generally want everything in your scene to be in focus. That means your aperture should be at f/8, f/11 or f/16. Once that is set, then you will need to set your shutter speed accordingly. You may have to take your shutter speed down to a few seconds to get a properly exposed shot. Thats okay, it adds to the image. Long exposures work really well when there is moving water or clouds in the scene; the water becomes soft and silky as do the clouds. Sometimes, the trees in your scene may wave in the breeze and the blur from that can work well too. Another setting to look out for is your ISO. I recommend not to shoot in Auto ISO. This will create all kinds of problems especially at sunset. Your camera will see that the light is fading and it will simply bump up the ISO to compensate for the loss of light, this may result in digital noise, not very good for your landscape scene. Set your ISO to 100 (or as low as your camera goes) and keep it there. Only adjust your shutter speed to make sure you get the shot and of course, you will need to be on that trusty tripod! This is a creative choice. Start out shooting your scene in daylight white balance. Avoid using auto WB as this function will try and neutralize the colours in your scene. You want as much colour depth in your scene as possible, so start off with the daylight preset. You can then use the white balance creatively, for example, using the Fluorescent preset will add magenta to your scene, Cloudy and Shade will add orange or red, and Tungsten will add blue. If you want to emphasize any of these colours in your scene, switch to the WB that will boost that. So, if you are shooting a sunset, use cloudy or shade to boost the reds and oranges. If these don’t work well for the scene, stick to daylight as it will render the colours in the scene correctly. Once you return from your shoot, download your images and take a look through them. Normally, you will be doing this very late at night, so it is best to leave them until the next before you start editing them. Whatever your editing suite of choice is (Lightroom or Photoshop) you can get to work on them there. 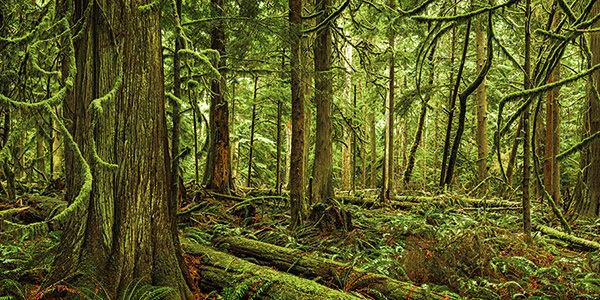 If you have shot some bracketed shots, you can do all that blending in Photoshop. The only guideline here is to take your time editing the images. Choose only the best images to be edited. You may find that you will shoot 100 images but only three or four are worth editing, thats okay. Edit only the best images and spend time making them look as dramatic as the scene you saw! For some quick tips on how to get your images to pop take a look at this article, you can also browse through this list of articles on Photoshop to get some in depth techniques. A blended shot, the foreground was shot earlier in the evening and the stars much later. This was blended in Photoshop afterward. So, to wrap it all up, landscape photography is a combination of skill and patience. Skill takes time to develop, and patience enables you to wait for the right scene to unfold. In this fast paced digital life, there is something calming about shooting landscapes. You have no control over the weather, you have no control over the light, you simply have to be there, and press the shutter release if the conditions are right. The beauty is that, if the conditions do work out, the reward will be unreal. You will have some great images and you will have spent some quiet time in nature, enjoying a beautiful sunrise or sunset. The most important tip is to take your time. Don’t rush the process, don’t pack up until you are certain you cannot get a better shot than the last one you just made. Always go out and have fun, even if the light doesn’t play along or the weather is not what you hoped for, use it as a practice session and pretty soon, you will be capturing those breathtaking scenes with ease! The post 5 Tips for Newbie Landscape Photographers by Barry J Brady appeared first on Digital Photography School. If you’re serious about landscape photography, it won’t take you very long to realize the fundamental problem of the craft: not every landscape that catches your eye will easily translate into a compelling photograph. When we experience a place, the smells, sounds, the warmth or chill in the air, and our own emotions combine to give us an overall impression. Our job as photographers is translate that overall impression into a photograph. 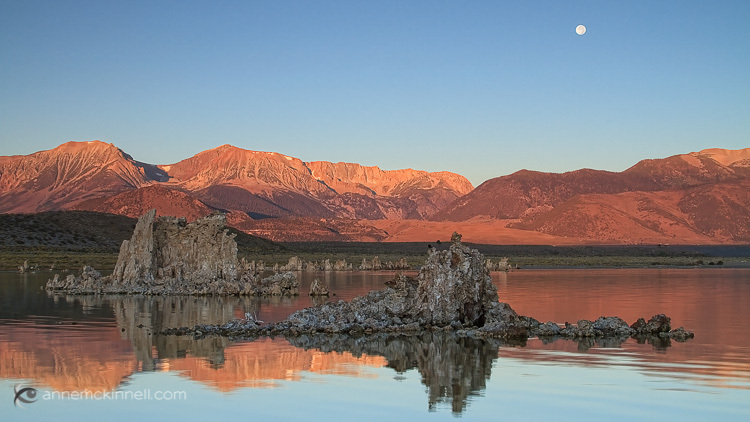 Every landscape photo needs to be carefully crafted with the final image in mind. There are many problems we run into along the way that can prevent our overall impression of a scene from shining through in the final image. The following are the most common traps to expect, and how you can avoid them. On most DSLRs (and some compact cameras), you can overlay a grid on either your viewfinder, your live view screen, or both. Align your horizon with one of these lines. Newer, higher-end cameras often have a built-in electronic level. When turned on, it will gauge the camera’s position in space and tell you when it is evenly aligned. Some cameras have a bubble level attached and some tripods will have one as well. If you don’t have one built into your gear, you can purchase one that affixes onto the camera’s hot shoe. Just like a spirit level in construction, this will help you straighten your camera out. If all else fails, every major photo editing software will feature a “straighten” tool which allows you to draw a line tracing the horizon. Using this, the program will automatically crop the image on an angle to make sure that the line is perfectly horizontal. Most people photograph from an eye-level standing position producing photos that look as you would expect to see things if you were there. For a more interesting composition, try climbing on top of something, or getting close to the ground to achieve a different point of view. Without clouds, birds, or some other interesting feature, empty skies can turn out pretty flat and boring in a photo. Try to compose your picture with something interesting in the sky. 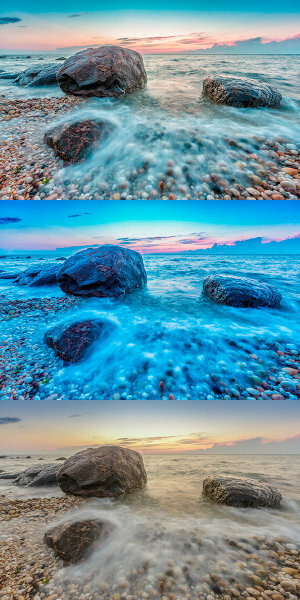 If there is nothing interesting to show, raise your horizon line to the top third of the image to minimize how much space the sky occupies in the frame. A blurry photograph loses almost all of its impact. Either use a tripod or use a fast shutter speed combined with image stabilization. 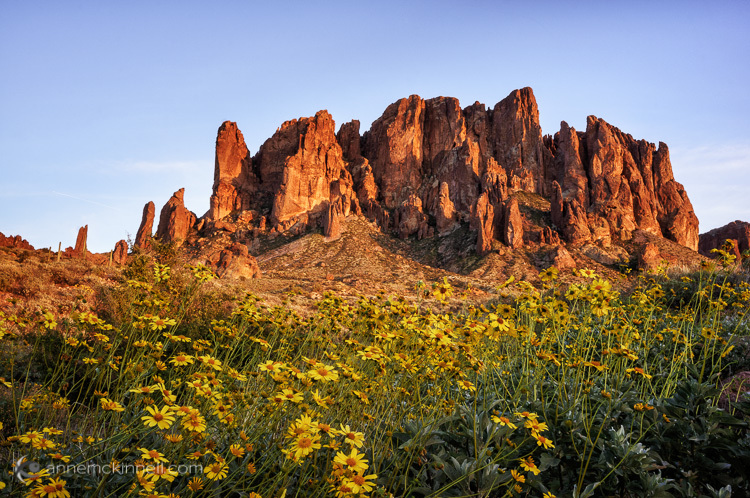 When it comes to landscapes, securing your camera onto a sturdy tripod will always yield better results. Even if you’re using short exposures, a tripod will allow you to compose your shot more precisely and lock its position into place while you shoot. Skies and mountains are lovely, but a picture can’t be all background. Your photo needs a focal point to hold the viewer’s interest. This can be anything – an interesting tree, a boat, a pier, a log – but no landscape photo is complete without a main subject. The opposite also applies – be careful not to focus too much on the subject and forget about how the background comes together. Pay attention to what is behind your main subject. If the background elements don’t add to the composition remove them if possible. Be careful that you have separation between each element, and don’t let them visually blend together (ie. two or more trees merging into a greenish blob). This is especially problematic when the objects are backlit or silhouetted. When you rely on the sun to light your shots, you’ll find that some days the weather just doesn’t cooperate. Grey, cloudy days will give you muted, washed-out colours and not much in the way of shadows or contrast. Extremely sunny days might do just the opposite. Carefully consider the lighting conditions on your scene before you decide how to approach it. If the sun is out, position it to one side of the camera to take advantage of the shadows and textures created by sidelight. If the sun is in front of the lens, your scene will be backlit and you can make some dramatic silhouettes. If the sun is behind you photographing the scene will be more difficult because the direct light will make the scene appear flat. Consider changing direction. If there is no sun and the sky is white, use the soft lighting conditions to make close-ups. If the sky is overly bright (say, in the middle of the day), it can confuse the camera’s light meter, which will try to compensate by underexposing the rest of the image, resulting in a dark foreground. If this happens, use the exposure compensation to turn up the brightness, but not so much that the sky becomes blown out (turns white). If you’re having this problem, try re-composing your image to include a darker area of the sky. This type of scene is a good time to use a graduated neutral density filter. These filters are dark on the top and clear on the bottom. You place it in front of your lens to darken the top half of the image and even out the exposure. It’s not just the sky that can blow out, though – a hot sun can cause glare on many surfaces. Watch your scene for bright spots caused by reflections or excess sunlight. Most cameras have a “highlight warning” viewing mode on the image preview which will show any pixels that have turned pure white. If you have blown out highlights, use the exposure compensation to reduce the exposure slightly until they are gone. Even though a photo is a two-dimensional image, a strong landscape composition gives the illusion of depth. When you’re setting up your shot, make sure to populate the frame in the foreground, mid-ground, and background. When you are learning photography it can be hard to critique your own work and understand how to improve. After your next photo shoot, examine your images for these problems so you can avoid them next time. Looking at each of your images with a critical eye and considering how they could be improved will quickly improve your artistic eye and make you a better photographer. 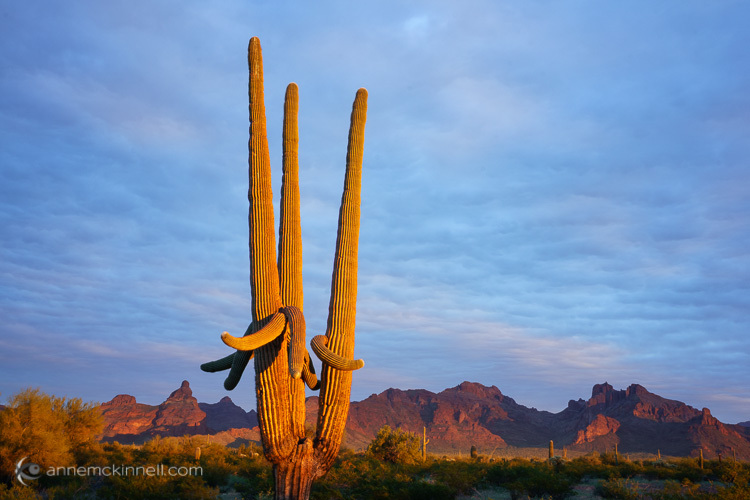 The post 10 Most Common Mistakes in Landscape Photography – and How to Overcome Them by Anne McKinnell appeared first on Digital Photography School. A few weeks ago I spent seven days travelling across the northern tip of New Zealand’s South Island. Anybody who has been here knows that it is a beautiful place. I often come across remarks by photographers referencing New Zealand as a destination on their list of dream places to go to. Who can blame them? It’s a spectacular country, with beautiful landscapes. However, the road trip brought home something of interest to all landscape photographers – landscape photography is hard. Really hard. Not only do you need a beautiful location, but you are also relying on the weather and light to be conducive to the type of photo you want to take. If it isn’t, there may not be time on a short trip to wait for the ideal conditions. It’s also a challenge to find an original way to photograph the landscape. Many other landscape photographers have been there before you. It’s difficult to create something new in a short space of time. 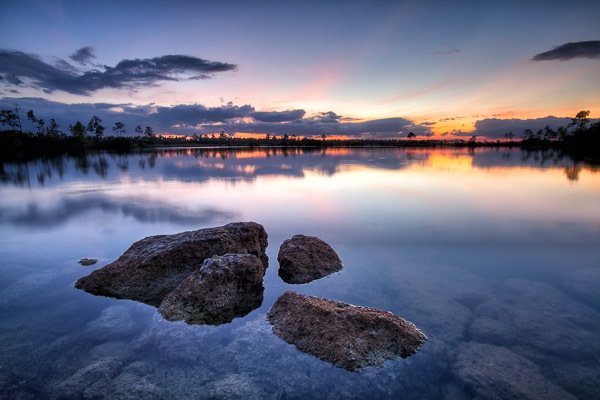 Here are a few tips to help you do better landscape photography. 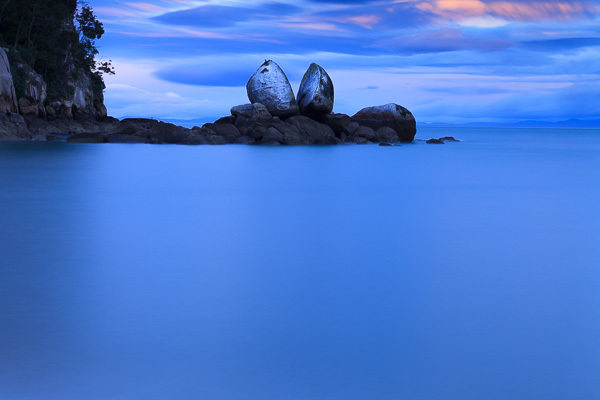 Split Apple rock, near Abel Tasman national park. I like this photo, but is it original? 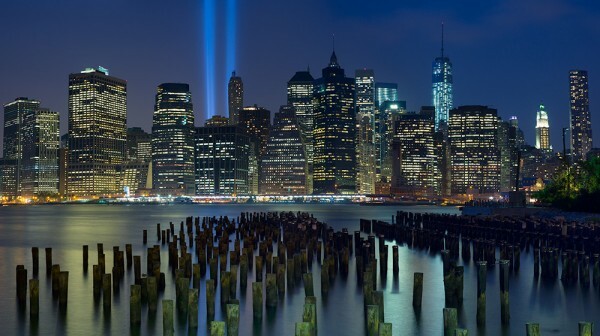 Not really – it’s a popular landmark and has been photographed by hundreds of photographers. It’s very difficult to create something new here. While there are ways to help ensure that you get the most out of a trip away (watch for those tips in an upcoming future article) today I want to make the point that one of the biggest advantages any landscape photographer has is intimacy with the landscape. Intimacy comes from a deep knowledge of ,and a connection with the landscape. It’s an appreciation of the people that live there and the history of the location, plus an understanding of how the landscape changes through the seasons. People who have an intimate relationship with a region usually live there, or visit often. They are not passing through (like I was on the South Island). They know the best places to take photos, and when the light, seasons and weather are most likely to align to create the best results. If you are struggling to find ways to photograph your local landscape, maybe it’s time to come at it from a different perspective. How can you turn your familiarity with your local landscape into an advantage? Let me give you some practical examples. I live in Wellington, a city at the southern end of New Zealand’s North Island. I’ve never thought of it as a great location for landscape photography. Relatively speaking, it doesn’t have the spectacular landscapes of the South Island, nor the sub-tropical bush or white sand beaches of the northern half of the North Island. However, I’ve found other ways to incorporate the landscape in my photos. I know some good locations for these, including places that I would never have found on a short visit. The coastline south of the city has some beautiful, rugged locations. Walking along the sea front during all four seasons has given me an appreciation of how beautiful and changeable it is. The light and landscape change with the seasons and the weather, and I’d never understand that if I didn’t live here. Best of all, once I’ve found a location, I can wait out periods of inclement weather and return when the light is best to take advantage of it. The benefit of these techniques is that they help you create photos with a very different look to what many photographers will take. I recently came across the work of Mark Gee, another Wellington resident. He’s rather good at night photography. Most of his photos are taken in the local area and show an intimacy with the landscape that only comes with local knowledge and time. 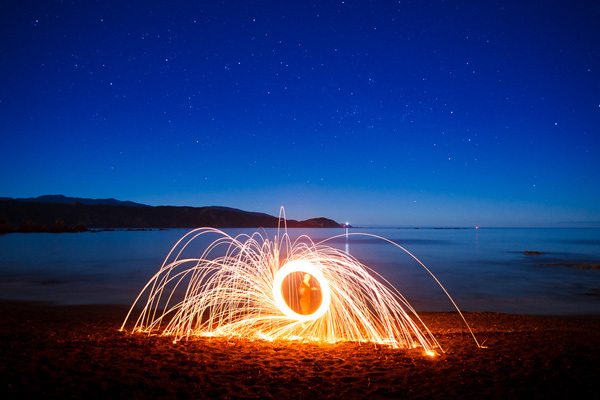 Painting with light and steel wool spinning are two that come to mind. The lack of spectacular landscapes has pushed me off into different directions as I look for more ways to make the most of the scenery we do have here. Mark Gee’s work has inspired me to try some night photography, and that ties in neatly with these techniques. Again, the freedom to return to the locations I want to use when the sky is clear and there is no wind is priceless. If you are looking for original ways to photograph your local landscape, perhaps either of these techniques will help! I take most of my portraits outside, using my favourite locations as backdrops. Sometimes a certain location may not be great for landscape photography, but it is ideal for taking portraits. The local landscape has become a part of my portrait work, and my style. If I lived somewhere else, my portraits would have a different feel to them. How can you incorporate your local landscape in portraits? Are there any other ways to utilize the local landscape? There’s one way I can think of – tell a story. Perhaps there is the potential for a documentary project in your area. Stories are inevitably about people, so think about how local people interact with, or depend on the local landscape. For instance, activities such as running, sea kayaking, cycling, surfing and wind-surfing are all popular here in Wellington. Any one of those could make an interesting documentary project. 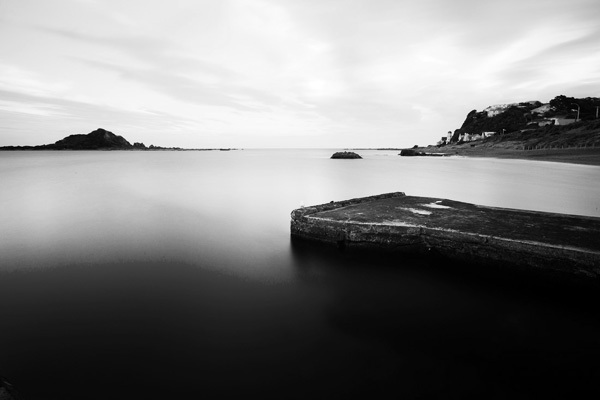 Or something more simple, such as Nathan Wirth’s seascapes with a Buddha. What options do you have in your local area? Ultimately, all these ideas are about the same thing: going deep and exploring your relationship with your local landscape in a way that isn’t possible on a brief visit. It’s the same reason that National Geographic photographers go away on assignment for months at a time. Intimacy with your subject and time produce a depth of coverage that you can’t get any other way. 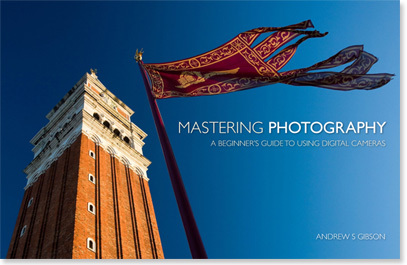 My ebook Mastering Photography: A Beginner’s Guide to Using Digital Cameras introduces you to photography and helps you make the most out of your digital cameras. It covers concepts such as lighting and composition as well as the camera settings you need to take landscape photos like the ones in this article. The post The Intimate Landscape – 5 Tips for Better Landscape Photography by Andrew Gibson appeared first on Digital Photography School. This shot was taken just after a January snow storm. 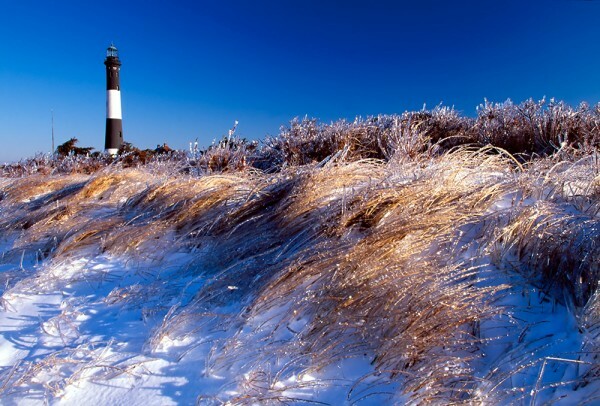 The ice glistening on the dune grass made for an excellent foreground while the lighthouse towered in the background. A polarizer was used to help darken the sky. 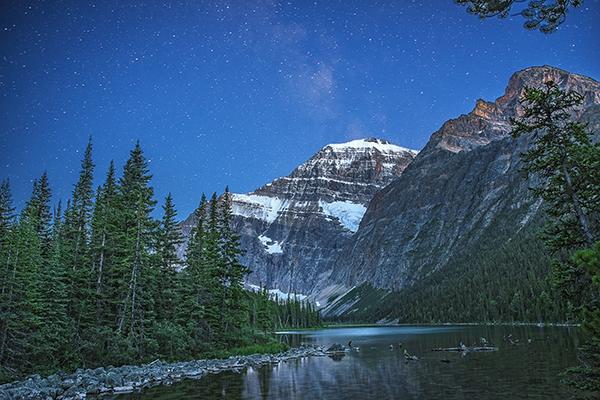 Taken with the EOS 5D Mark II and EF 16-35mm f/2.8L II. ISO 100, 1/250 at f/16. Living on the east coast of the United States, I have easy access to any number of beaches to use as subjects for my photographic purposes. While many of these beaches may not be as dramatic as those on the west coast, they offer many photographic opportunities and shouldn’t be overlooked. Most people think of the beach as being a summer destination, but I’ve found it to be an excellent location all year round for a variety of reasons. Dramatic skies and rushing water can make even the simplest composition interesting. I used a low point of view and a slower shutter speed to capture the water rushing straight at the camera, ready to grab the tripod if the water knocked the tripod over. The clouds eliminated any bright sunlight and created an almost monochromatic image. EOS 5D Mark III with EF 14mm f/2.8L II. Exposure was 8 seconds, f/20, ISO 100. 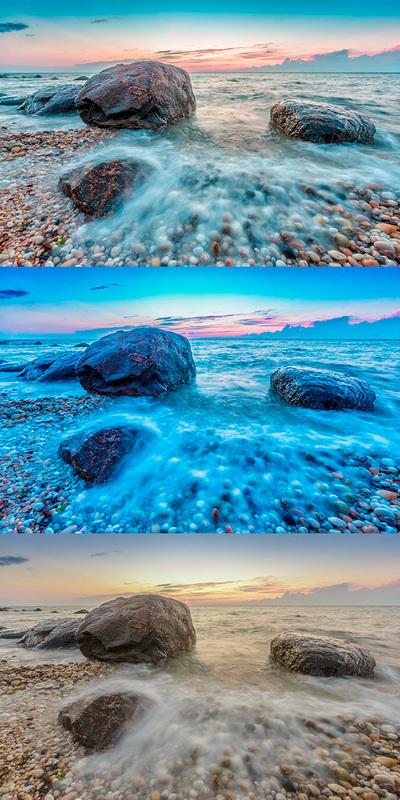 Photographing Seaside Landscapes poses a number of problems for the photographer. There’s wind, sand, and water to contend with, and keep out of your equipment. There are some precautions you can take to minimize the chances of disaster striking. First, I usually spread a blanket out and put my camera bag down on that. It helps prevent sand from getting the seams of the bag, and it also lets the flap of my backpack rest somewhere other than sand. I speak from experience when I say that resting that lid on the sand and then flipping it up to close it is a good way to get sand inside the bag. The next issue is the water. Obviously, the most basic rule is to keep your bag as far away from the water as possible. Pay attention to the tides and watch that the waves aren’t coming closer to where you’ve stashed your gear. But that’s only half the issue. Generally when I’m at the beach, water is at the very least a major part of what I’m shooting. I tend to take a few chances here. I like low angles, and dramatic shots. That tends to put my camera right in harm’s way. If I’m not on a tripod, I ensure that the strap is always around my neck to keep it from falling. If I’m on a tripod, I tend to keep my hand ready at all times to grab it and move if a big wave comes. If it helps you feel more secure, you can always use a rain cape to protect from splash, or if submersion may be possible, an underwater housing might be called for. I don’t personally use any of these items and just use a lot of care when near the water, but I have heard many horror stories of cameras that went swimming. Sunrise and sunset are my favorite times for the soft warm light they provide. 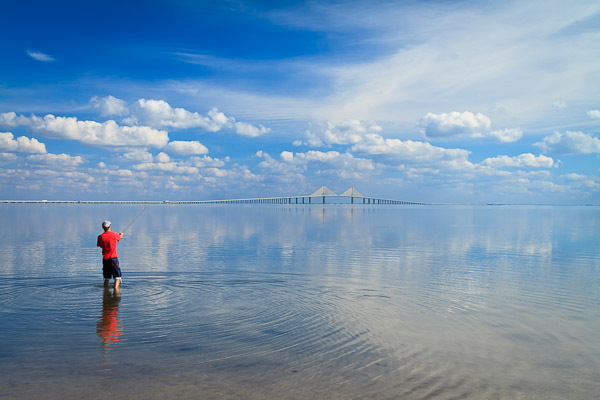 I use graduated neutral density filters when they are called for, depending on the light, as well as standard neutral density filters to help control my shutter speed to determine how I render water. I find myself going back to the same beaches over and over. By their nature, they change often, as weather erodes them, tides build them back up, and secrets beneath the sand are revealed. Often after a storm is the best time, as the combination of wind and rain will create patterns in the sand and pools of water which create beautiful reflections. Where do you find yourself visiting over and over to fulfill your photographic urges? 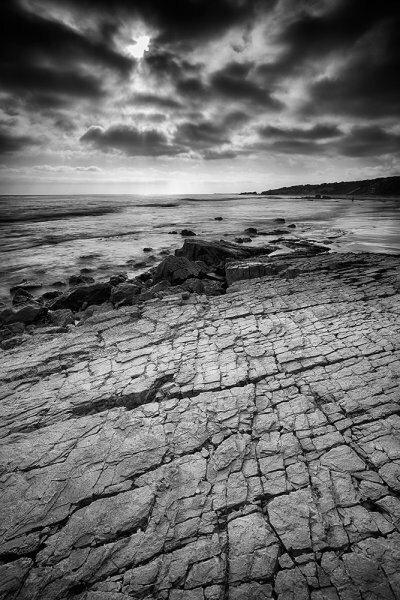 This shot is actually a west coast beach- Pelican Point in Laguna, California. 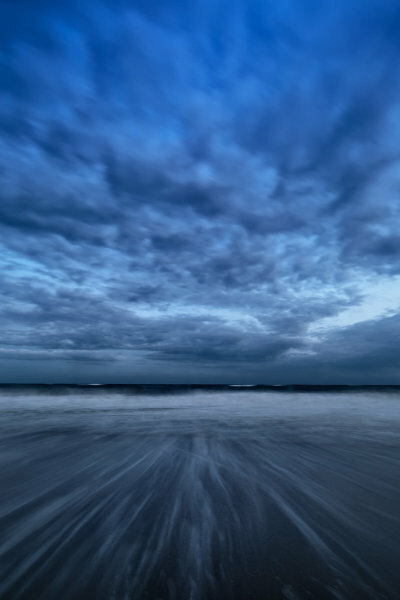 A 4 stop ND grad was used to darken the sky. 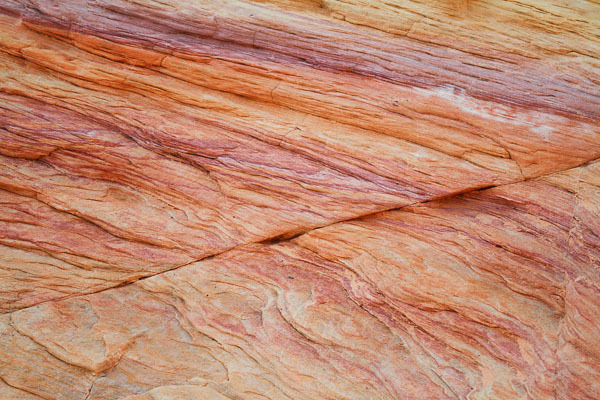 The foreground is a large rock with a beautiful pattern of cracks for interest. EOS 5D Mark III with EF 16-35mm f/2.8L II. 1 second at f/16, ISO 400. This shot was taken at sunrise, as the tide was coming in. 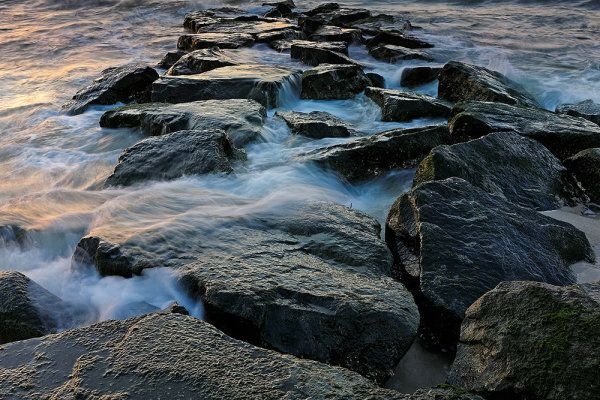 Water continually washed over the jetty, and the light playing on the water and rocks captured my interest. EOS-1D X with EF 16-35mm f/2.8L II. Exposure was .4 seconds at f/16, ISO 100. A 3 stop neutral density filter was also used. 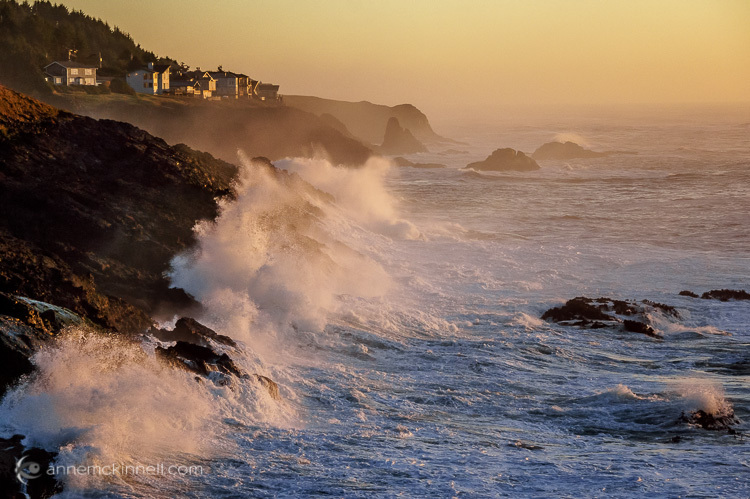 Have you had any success with Photographing Seaside Landscapes? Share your images and tips in comments below. The post A Day At The Beach: Photographing Seaside Landscapes by Rick Berk appeared first on Digital Photography School. 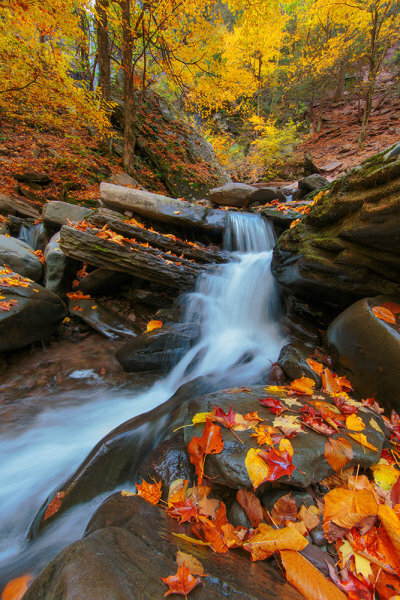 A small cascade at Kaaterskill falls in upstate New York. 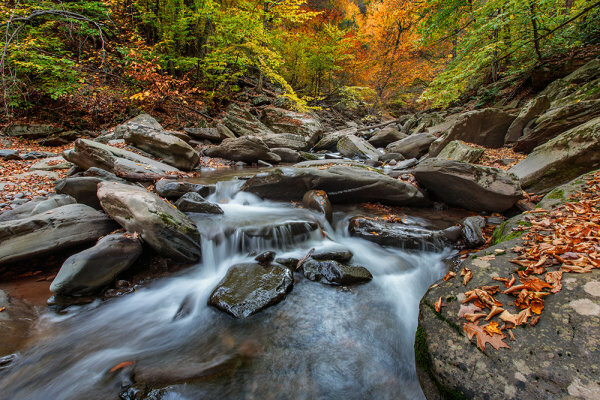 It’s important to balance the long shutter to blur the water, with the need for keeping the foliage sharp. While blending two exposures will accomplish this, I preferred to try and capture the scene in one exposure. Exposure was 1/3 second, f/22, ISO 100. 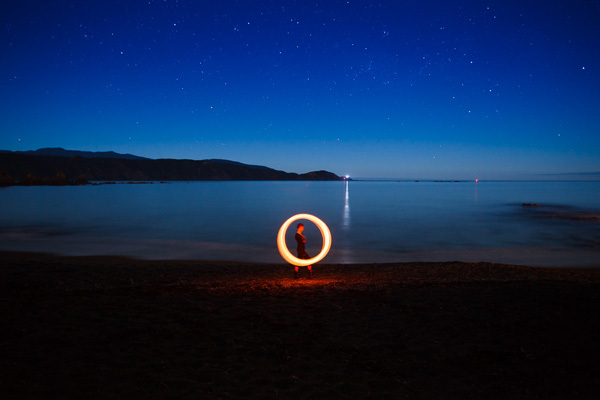 EF 14mm f/2.8L II with EOS 5D Mark III. While the northeastern Unites States isn’t a wealth of dramatic vistas ripe for the landscape photographer’s choosing, one thing we do have plenty of here are waterfalls. The list is endless- from Niagara Falls in northwestern New York, to the plethora of waterfalls that can be found in the Catskills and Adirondacks, to Great Falls in Paterson, New Jersey. These provide ample opportunity to photograph them, as many run year-round. I always carry a few things when photographing waterfalls. I like to get that milky look to the water, and for that of course you need a long exposure and for that you need a tripod to hold the camera steady. Next, I carry a polarizing filter. This allows me to control reflections, whether they be from shiny rocks glistening with water on them, or to control reflections on the water in the landing pool. I also keep a chamois in my bag to keep the lens dry. Depending on how hard the falls are flowing, and how big the cascade, mist can be a problem. Finally, I keep a set of neutral density filters handy. As I mentioned, I like a nice, milky look to the water, and if there’s too much light, I won’t be able to slow the shutter down enough to get that look unless I use the filters. I generally keep 3, 4 and 5 stop ND filters with me. Great Falls in Paterson, NJ. 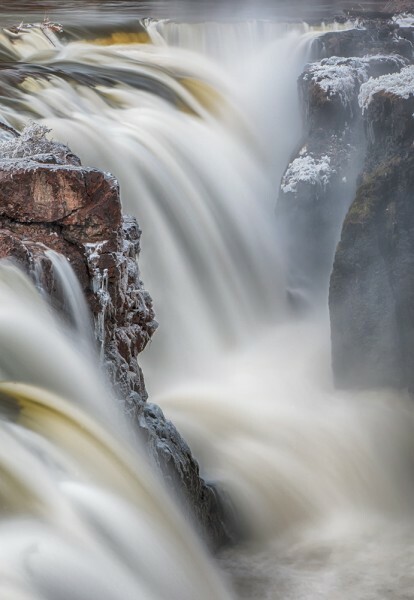 Photographing these falls in late winter, I was able to capture frost forming on the rocks from the spray. Exposure was 2 seconds, ISO 100, at f/22. EF 24-105 f/4L IS, with EOS-1D Mark III. When photographing waterfalls, the first thing to consider, as with all subjects, is the light. I find photographing waterfalls in flat, even light, such as on an overcast day, to be ideal. Ultimately, you don’t want the waterfall in direct sunlight. Direct sunlight on a waterfall has a tendency to create such a high contrast scene that either your highlights are blown out, or your shadows are blocked up. Flat, even lighting allows you capture the full range of detail in the scene without losing detail in the highlights or shadows. Next, you need to consider the look of the water you want. While I prefer that milky, fantasy-like look, you may prefer more detail. Try a variety of shutter speeds to see what works best for you. I find 1 second to 30 seconds works well, but much will also depend on how much water is flowing over the falls. More water rushing faster will not require as slow a shutter speed as less water flowing at a slower pace will. 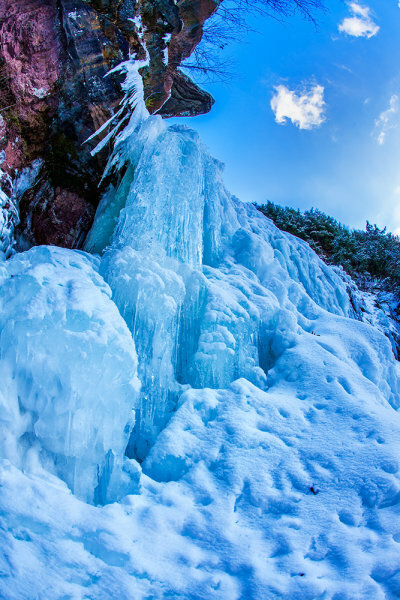 I hiked up these falls in mid-winter- a treacherous, icy hike that almost resulted in injury! This was the base of the tallest cascade, frozen almost solid. It pays to visit these locations year round to get different perspectives. Exposure was 1/20, f/16, ISO 100. EF 15mm f/2.8 Fisheye with EOS-1Ds Mark III. Waterfalls change with the seasons. In the spring, when snow is melting, waterfalls will be fuller and faster flowing. Some waterfalls only flow at this time. Others run year round, but the amount of flow changes. And in the winter, depending on the climate, some falls can freeze into columns of ice that create an entirely different spectacle. It pays to revisit these falls at different times of year, to take advantage of all of the opportunities a particular waterfall presents. One last thought: While many of the waterfalls I’ve photographed are easily accessible, many others require some arduous hiking. Try to get as much information as possible on a new location before going there, and be prepared for anything. This was another small cascade that I found on the way up to the upper falls. These smaller cascades present great opportunities to really create dynamic compositions, layering the foreground, middle ground, and background, and using the leading lines of the water. Exposure was 1 second at f/16, ISO 100. EF 16-35mm at 16mm with EOS 5D Mark III. 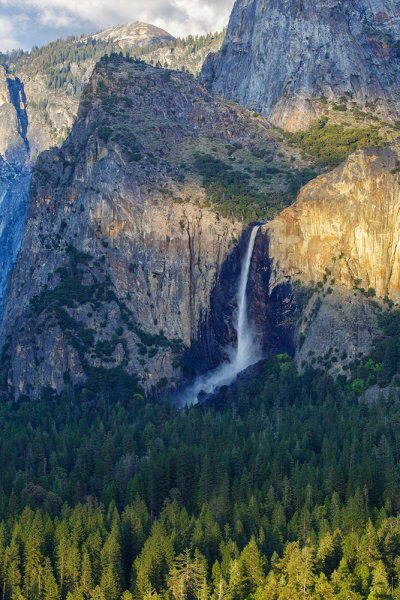 The post Falling for Waterfalls by Rick Berk appeared first on Digital Photography School. 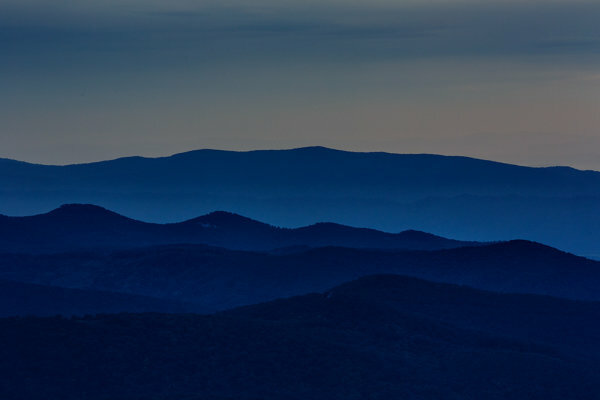 This shot of the Blue Ridge Mountains was taken with an EOS 5D Mark III and EF 70-200 f/2.8L IS II lens at 200mm. The telephoto nature of the lens compresses the distance between the ridges, creating a flat, graphic look with shades of blue created by the mountains and mist in the valleys. Exposure is 1/3″, f/16, ISO 400. 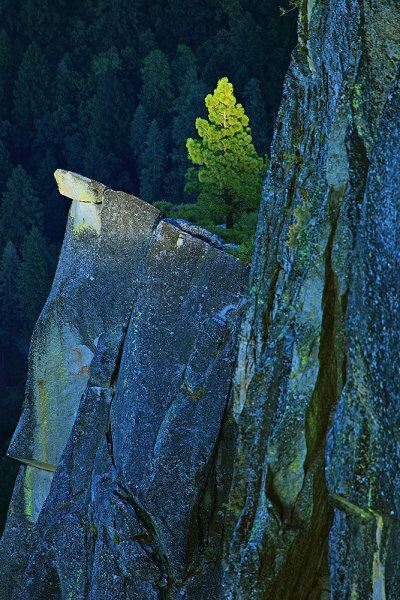 This shot of a lone pine on the side of a cliff was taken from Glacier Point at sunset. Using a 400mm lens allowed me isolate the tree being kissed by sunlight while the background behind went dark. I used an EOS 5D Mark II with EF 100-400mm L lens at 400mm. Exposure was 1/60 f/8, ISO 100. If you’re anything like me, when presented with a beautiful landscape, your first instinct is to reach for the wide angle lenses and take it all in. And there’s no doubt about it- wide angle lenses can excel in those situations. But don’t neglect the telephoto lenses in your bag when you find yourself faced with nature’s beauty. Telephoto lenses can create shots that are every bit as breathtaking as their wide angled brethren. Telephoto lenses, first and foremost, can allow you to isolate an area of the view you are shooting, because a telephoto sees a narrower angle of view than do wide angle lenses. Because of this narrower angle of view, telephotos also help normalize the size of near objects in relation to faraway objects. With wide angle lenses, when you fill the frame with a near object, it will appear much larger than a similar sized object placed further away. With telephoto lenses, near objects and far objects will appear to be similar in size, because telephoto lenses normalize the size and distance when comparing the two objects. The downside to this is that the scene can then appear to be static and flat.There are cases where the flatness can be used to advantage, for instance creating graphic images using the lines and colors of the landscape. Telephoto lenses appear to compress distance, so two objects relatively far apart will appear to be very near to each other. This is helpful when trying to enhance the density of a subject, such as a field of flowers. Flowers will appear to be stacked right next to each other, even though they may be several feet apart. This can be used to great advantage for creative textures and patterns. Often, when I’m trying to divide the space in my bag, a friend will ask why I need a telephoto lens when I’m planning to shoot landscapes. This is why. I may not use it every time, but when I do get an opportunity use a telephoto lens in a landscape situation, I like to be able to take advantage of it. This shot, taken with an EOS 5D Mark III and EF 70-300 f/4-5.6L, shows how you can isolate one area of a landscape, here focusing on Bridal Veil Falls in Yosemite National Park. 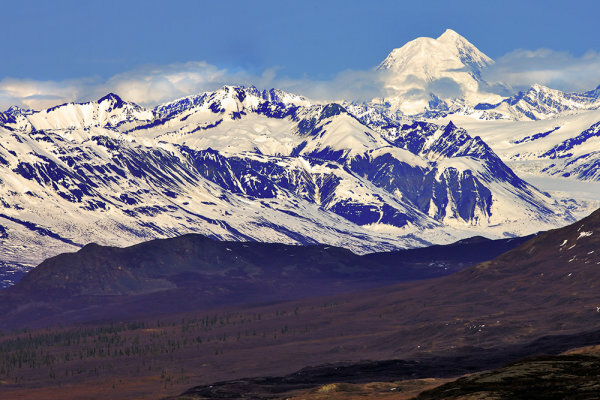 This shot of the Alaska Range was taken from Denali Highway using an EOS-1Ds Mark III and EF 70-200 f/2.8L IS II. The telephoto lens compresses the distance between the foothills and the mountains, making them appear to be right next to each other.